About - Driftwood Fine Yacht Services -Grenada, W.I. 30 years experience of fine woodworking and knowledge of yacht repairs. Along with this partnership, Driftwood has enthusiastically expanded its excellent woodworking craftsmanship to include many other yacht maintenance areas. Check out the Services page for a full list of what Driftwood can do for your yacht maintenance needs. Driftwood Fine Yacht Services has two work sites in Grenada. The main office is located in Clarkes Court Boatyard and a satellite location that is in walking distance from Port Louis Marina. Driftwood Fine Yacht Services prides itself on providing quality and outstanding service to our customer. We strive to provide top of line craftsmanship and product for all our customers' needs - no matter how small or large the project. Our goal is making sure your needs for your yacht are met so you have a piece of mind and understanding of what is best for your project. Driftwood aspires to be the best you will find in yacht services, skill, knowledge, and maintenance in Grenada and the Caribbean. 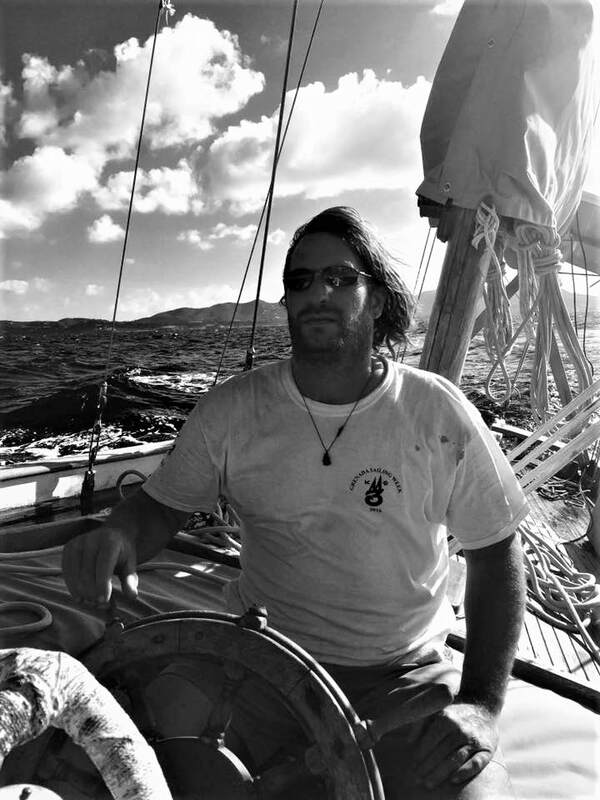 Meet Steffen Meyerer, Founder and Owner of Driftwood Fine Yacht Services, located in Clarkes Court Boatyard and Marina, Grenada. Steffen was born in a small village nestled in the biggest connected forest area in Germany. It was in the local forest department that he found his passion for woodwork. His first side job during his adolescence was working for a company in the local forest department that designed and constructed innovative wooden kitchen appliances created from the surrounding trees. After finishing his schooling, and one year of travel in New Zealand, Steffen Meyerer returned to Germany and successfully completed a cabinet making apprenticeship. With his new skills, Steffen headed out to travel and explore. He found himself in Cape Town, South Africa where the boat-bug bit him. Spending some time on liveaboards in Simons Town Yacht Club and learning the ropes of boats, he became the owner of his own Endurance 37. After several months, he and his wife Kate set sail across the Atlantic and found themselves in Trinidad. In Trinidad he spent a season refitting Charter Catamarans and working on the set of "Pirates of the Caribbean." With a little money in the coffers, the Meyerers found themselves heading for the yachting community in Falmouth Harbour, Antigua. It was here for 7 years that Steffen began to work with Chippy and learn the tricks of the marine carpentry trade from Jerry Bardoe. Working on fine yachts, Steffen grew his portfolio with fine interior Veneer work to teakdeck replacements and general refits. In 2010, Steffen and his family found their way to Grenada and opened Driftwood Fine Yacht Services. The last 7 years Driftwood has worked on everything from small cruising boat projects to interior & exterior refit of the 66' Alden Ketch "Desiderata" to various Super Yachts and warranty work for Oysters, Leopards, and Privileges. As the demand for quality yacht services in Grenada increased, Driftwood widened the scope of work to provide even more marine services. And in 2017, the splicing together of Steffen Meyerer's experience in Fine Yacht Carpentry and the shipwright skills of Judd Tinius of Galatea marks a new chapter at Driftwood. Between the two partners, they have a combined total of 30-plus years experience. This brings Driftwood to the next level of extensive knowledge and experience of working on not just modern yachts and boats, but to the classic wooden boats as well. The history of woodwork coupled with desire to explore and travel is the recipe for what Driftwood is today. St. Croix Marine for three years. Judd was born and raised on the northwest coast near Everett, Washington in the United States. It is there that Judd found his passion for sailing and woodworking at the tender age of 7. He was born into a family that loved sailing wooden classic boats and woodworking. His began his career at 11 years old by sweeping the sawdust off the floors of his uncle's woodworking shop. While working in his uncle's shop, he started his apprenticeship under British boat builder/joiner Peter Grove. After learning and working under Peter's guidance, Judd took to the sea on Lady Washington, a replica square-rigger that did educational cruises along the west coast. After his time there, he had the desire to learn more about rigging and shipwright skills. He found himself under the tutelage of Jamie White of the San Francisco Maritime Museum and getting hands-on experience re-rigging the Moshulu, a 417ft four masted barque.. In 2002 and over the next three years, Judd put his shipwright skills to work on Galatea. In 2005, Galatea was launched with a newly built wooden mast, re-caulked teak decks, brand new teak butterfly hatches, bulwark and cockpit coaming, a new sleek companionway, and many other projects along the way. After a few months of sea trials and tweaking, Judd decided it was time to take Galatea our of Washington's cold, wet weather and head to the warm, turquoise waters of the Caribbean to refill his coffers and of course put his hard work to the test of racing Galatea in the Caribbean Regatta circuit. Like many who sail and travel, he needed to find work to refill his coffers. With his skills and knowledge as a shipwright Judd found work in Antigua at Phoenix Custom Carpentry. He lived and worked in Antigua for six years honing his craft of shipwright on many mega yachts, classic boats, and charters. After six years of working and racing in the Caribbean, like many true sailors, Judd thought it was time to stretch his legs and set sail across the Atlantic. For the next three years, Judd traveled, worked, and raced in many different places in Europe. Once his time in Europe came to an end, he set sail back to the Caribbean and found himself in St. Croix, USVI. In St. Croix, he worked for three years as yard manager at St. Croix Marine. However after three years, the sea and demand for quality yachts services came calling from Grenada. In December of 2016, Judd joined as partner with Steffen Meyers at Driftwood Yacht Services. With the partnership of Judd and Steffen, Driftwood continues grow and expand not just in fine yacht woodworking but in many different areas of yacht refitting and services. Driftwood Fine Yacht Services crew is comprised of many years of experience and different skills sets. Our crew's cumulative technical know-how is the key element which enables us to provide our services with a comprehensive support option that is hard to beat. Our intention is to understand what the client really needs and wants to enable our crew to help make life on the open water a more enjoyable and safe experience.